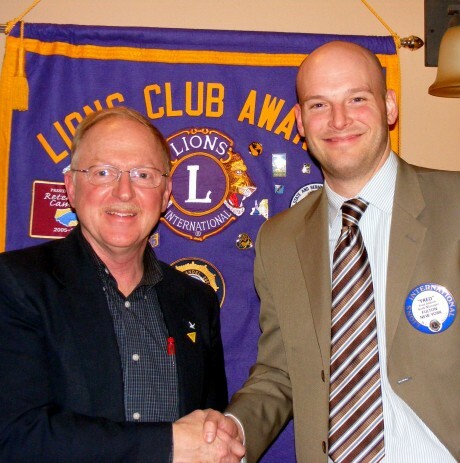 Roger Fox, Oswego County Search and Rescue (left), was guest speaker at the Fulton Lions Club Feb. 24 meeting. Fox explained the origins and reach of the program and shared information on the Oswego County Sheriff’s Project Lifesaver program that uses electronic “tagging” to locate missing people. He is joined by Fred Aldrich, club president. The Fulton club is one of the largest and most active in their district. 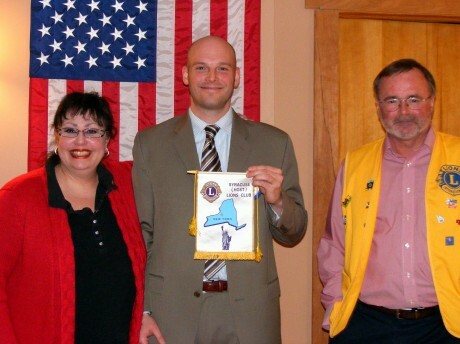 Lions clubs are committed to sight and hearing preservation. The Fulton Lions Club, also know for their Lions Loot Sweepstakes and Labor Day Duck Derby, provides financial assistance for those in need of eyeglasses, eye exams and hearing aids to residents in the Greater Fulton area. For further information on Fulton Lions, visit www.FultonLionsClub.org. Members of the Syracuse Host Lions Club visited the Fulton club’s Feb. 24 meeting and presented Fulton President Fred Aldrich (center) with a banner for the club flag. Representing the Syracuse club were Janet M. LaFrance, second vice president, and Dave Chayka, first vice president. The Syracuse Host club, chartered in 1924, sponsored many new Lions clubs in central New York and they helped create and sponsor the Central New York Eye Bank in 1955.